The goal of this challenge is to create a storyboard for a 2-minute animation video that describes the use and benefits of our Wireless Smart-Valve. 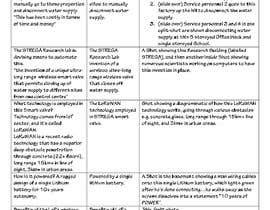 A background summary is provided below, although careful reading of the attached brochure description and the concept of LoRa LPWAN technology is recommended. The winning solution will be developed into a video via a separate freelancer activity (contest or direct bid), for which submitters, and others, are eligible to participate. The wireless Smart-Valve is using a quite recent radio technology coming from the IoT sector called LoRaWAN: this technology has a exceptional deep obstacles penetration, even through concrete (22+ floors in a building, 15km+ line of sight, 3km+ in urban areas). It works on simple Lithium batteries for 10+ years autonomy and is of rugged design. Valve has also its own smart intelligence and can open or close the water inlet in case of abnormal condition (i.e leak detection). At the end of the job here, such animated video for the STREGA Smart-Valve will be made (with your storyboard of course). 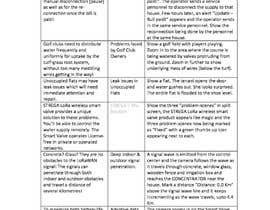 The attached PDF provides a description of the Smart Valve concept in more detail. Participants should Google "what is LoRaWAN" and few YOUTUBE videos to understand what it is. 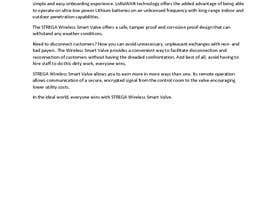 Please do visit [login to view URL] for detailed info about the product (only the SMART-VALVE and the STREGATE LoRa Gateway are concerned here for the moment. The Smart-Emitter for Irrigation will be part of another contest after this one. No need for illustration: word content is sufficient, thanks ! Might be dumb question but still have to ask, does the storyboard need illustrations or word content is satisfactory? Hello! Please keep this contest alive until it's end, i'm trying to write something for you. Thank you. Thank you ROOPAK1 for this first interesting first story. 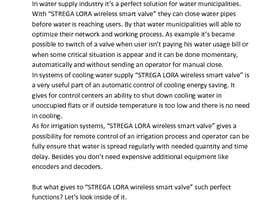 But this kind of Chlorine "disaster" would - normally - never happend in reality and it is is not the main goal of the SMART-VALVE (BTW, LoRaWAN is the radio technology used inside the Smart-Valve). What a Water Company should remember from the story is that for those users who are not paying ther water bills, the Water Company does no longer need to send an Agent to manually close the water main valve: with the STREGA Smart-valve, they can remotely turn Off (and On) the water supply (or the cooling water for a District Cooling application), making savings in manpower and quick reaction. While a bad-payer tenant discovers he has no more access to water (or cooling...): he will rush to his bank to pay his bill and the automatic billing system of the Water Company will send a wireless reopening of the valve. Your response is much awaited for entry #1 . "The winning solution will be developed into a video via a separate freelancer activity"
Yes we will - possibly - make another contest for the video, but if we see a good storyboard from a Freelancer having the skills to make the video, it will be obiously way faster and efficent to use that person. It will be either contest or direct hiring. This reads like the NASA contests, can you verify payment method please? So we feel more secure about spending our time working on this? what is wrong with payment method: we are doing this contest through standard FREELANCER payment method: I don't think I can change anything here. Please propose how we can secure your working time on our contest ? to jmgm106: what is wrong with payment method: we are doing this contest through standard FREELANCER payment method: I don't think I can change anything here. Please propose how we can secure your working time on our contest ? Sorry, yes, I will review payment method to make it acceptable. Yes we will - possibly - make another contest for the video, but if we see a good storyboard from a Freelancer having the skills to make the video, it will be obiously way faster and efficent to use that person.